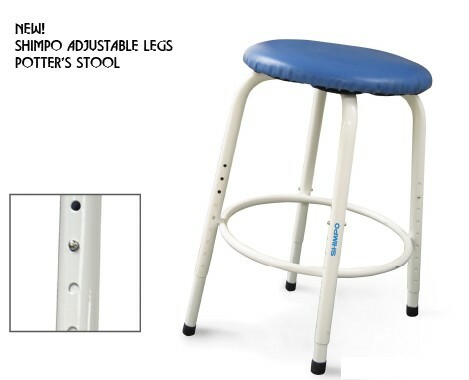 This Adjustable Leg Stool Features a Cushion Seat! Adjustable legs allows for tilted seating to ease back strain when throwing. Both models give you the comfort of a cushioned seat that you will appreciate after only a short time “in the saddle”. The adjustable leg version allows an assortment of heights to accommodate everyone, and can be tilted to relieve the strain on your lower back. The tilt feature also puts you over your work. 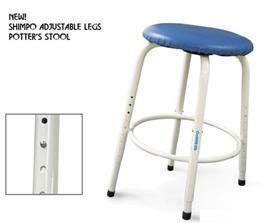 The stool is done attractively with a white frame and blue seat. The adjustable leg model not only serves the potter. The highest leg position will comfortably fill the needs of the painter and sculptor.